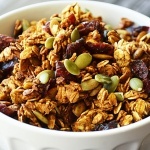 My kitchen smells sooooo amazingly good right now and it’s all because of this Pumpkin Spice Granola! I have been working on several versions of this recipe and finally…it’s just about perfect (if I do say so myself). Of course you can customize this one to include your favorite ingredients, but I wanted something that just speaks “fall” and I think it does. It’s really simple to make. 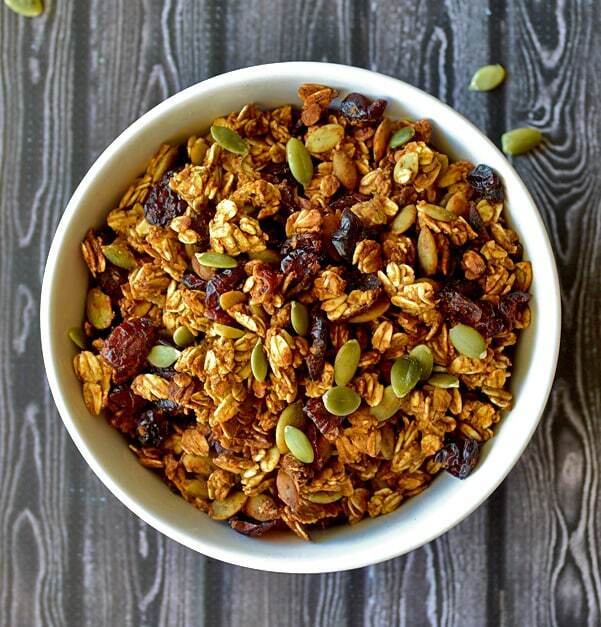 We mixed the dry ingredients such as old-fashioned oats and spices in one bowl, the wet ingredients in another and once combined, folded in the cranberries and pumpkin seeds. Spread evenly on a parchment or silpat lined baking sheet and stir frequently. Ours took about 30 minutes. Let cool completely before storing. 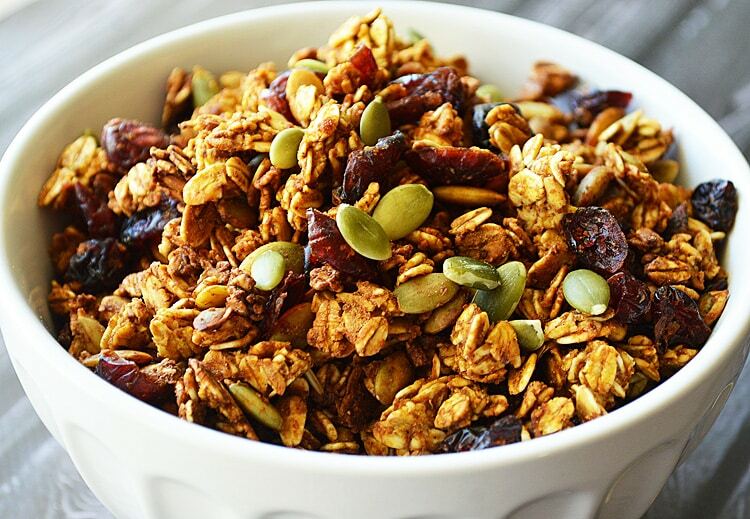 This is a loose granola, so you can use it to top yogurt … or just eat it straight. I didn’t even wait for it to cool before I was sampling it. In the end, I added a few extra pumpkin seeds. I might increase the quantity of pumpkin seeds to 1/3 C in the recipe when I make it again. Line your baking sheet with parchment if you do not have a silicone baking sheet. In a large bowl, combine the first 6 ingredients (oats through salt). In another bowl, combine the next 5 ingredients (maple syrup through vanilla) with a whisk. 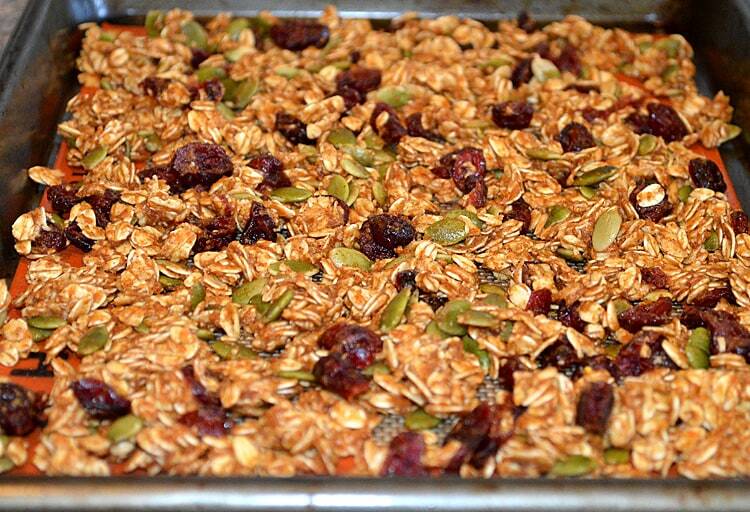 Add the wet ingredients to the dry and with a spatula, combine thoroughly before folding in the dried cranberries and pumpkin seeds. Spread evenly on the baking sheet and bake for about 30 minutes, stirring frequently. « REVIEW: New So Delicious Dairy Free Products! I totally never would have thought of using pumpkin purée or applesauce as the wet ingredients of granola…this changes EVERYTHING!